American Zombie: A con-profit reckoning? Our old buddy former Jefferson Parish councilman and C-note Richmond wingman, Byron Lee, looks like he may have finally been snagged in the con-profit epic along with current JP councilman, Mark Spears. AZ has covered some of Byron's con-profit meanderings ever since he came across my radar after I uncovered the NOCAP/NOCE con-profit scam perpetrated by Congressman Cedric Richmond and uber-political operative, Ike Spears. Oh...that reminds me...in case you aren't keeping up, Nadine Ramsey announced her candidacy for City Council District C a couple of weeks ago. I'm curious how she was going to justify residing over the Wisner hearing as an ad hoc judge in District D, offer ruling on that matter, then turn right around and announce her candidacy for city council. I think I may have done her a favor by calling out the conflict when I did. Also funny how no one seemed to care that the LA Supreme Court produced two separate, unstamped, documents on the same day for Justice Johnson's court order that had named Ramsey as a CDC ad hoc judge. Both documents were requested approximately one month after the original order was supposedly created...one order was signed by the Clerk of Court, the order I received was unsigned. Why were there two separate documents for the same court order? Regardless, Slabbed has been all over Byron , much more so than I considering it's a JP matter...waters I don't normally sail. In fact, I think Doug originally broke this story. I wonder if C-note will call in a favor to his new buddy in the local U.S. Attorneys Office to get some slack cut for Byron. We'll soon know if this whole thing seems to magically go up in smoke like the elusive internal report on the commenting scandal that was supposedly being conducted by the DOJ. Thanks for the HT, Mr. Defender. As readers know Lucas, the original Prophet of the Con-profit, is a long time target of AZ and I reported back in June of 2012 that I had uncovered the motherlode of con-profit mining schemes when I started researching Lucas and his associate Audrey Walker. Lucas had a whopping seven non-profits domiciled in a gutted building on 6030 St. Claude Avenue and between Walker and the Apostle I found 23 registered 501c3's back in 2010....earning them the infamous title of being the "Con-profit King and Queen of New Orleans". I challenged anyone to outdo the Apostle and Walker and so far no one has even attempted to challeng the royal court. That is until this report by the LA Legislative Auditor. So it looks like the con-profit epic in New Orleans may be taking a turn for the worse...at least for some of those on the lower rungs of the ladder. I'm sure you'll never see C-Note or Ike in that number...and should I even mention Bajoie? Nah...no sense in bringing that zombie back to life, eh? As I was writing this post it reminded me of the late night perusing I've been doing of the Michael Sherman email threads on Wisner and how in this city there seems to be only one degree of separation between just about everyone. Retraction: In this original post I posted an email from Michael Sherman's email chain and suggested a "Nadine" named in the email may have been Nadine Ramsey. It was not Nadine Ramsey and I have deleted the email from this post. Mea Culpa. 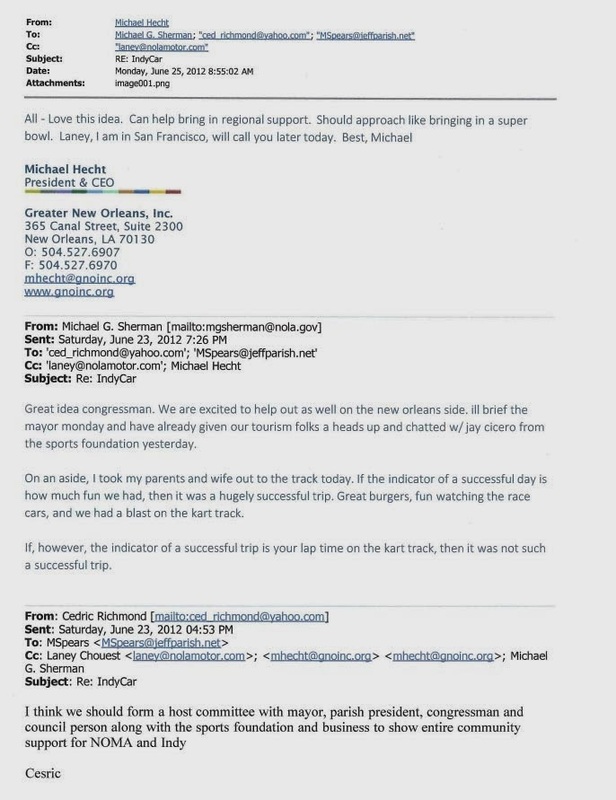 I'll do my best to avoid pointing out the sycophantic babbling to C-note (oops, I guess I just did) and just point out that Sherman seemed to be actively lobbying for Laney Chouest's NOLA Mortorsports park venture on multiple avenues. That's curious considering Sherman claimed he had never met Mr. Chouest in a Wisner Trust Advisory Committee meeting. 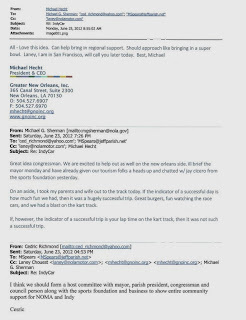 It's also interesting because it's apparent from Sherman's emails that he had a significant interest in the JEDCO/JP Fairfield development which encompasses Chouest's NOLA Motorsports Park and is adjacent to Wisner property. In fact, it appears as if Sherman may have even played a role in Chouest's purchase of the land from Joseph Marcello, who owns a massive portion of the property slated for development in the Fairfield footprint. What's most important is that it appears he was conducting much of this business while holding a position as a City Attorney and serving as the appointee to the Wisner Trust Advisory Committee for Mayor Landrieu. Since Mr. Sherman is no longer a city employee, I suppose he is now ethically allowed to raise money for Mitch's re-election campaign. Guess these emails and all of the BP/Wisner baggage Mr. Sherman appears to come with is of no concern to Mitch.